E.max is a great option for high cosmetic regions. We recommend to only use e.max for bicuspids and the anterior region. E.max is the best esthetic choice; however, the stump may show through. If the patient has a dark, we recommend taking a stump shade. At Stoller Dental Laboratory, all of our e.max is cad cam designed and milled in wax. From that point, it is invested, burnout, and pressed to your desired shade. From here, we cut back the facial so we can add hand stacked porcelain to achieve maximum esthetics. 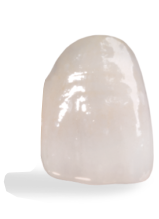 Wet milled E.max are not as strong, that is why we choose to go the extra mile to achieve stronger restorations. We also offer full contour pressed e.max for less esthetic areas or possibly to achieve additional strength.